Robert J. 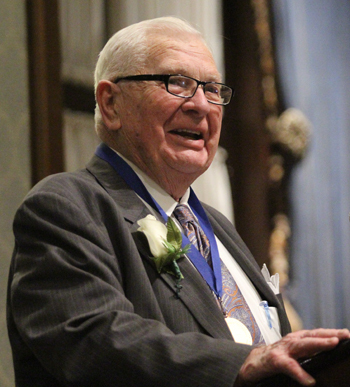 (Bob) Sims, who received the Catholic Philopatrian Literary Institute’s annual Sourin Award at an April 10 banquet at the Union League of Philadelphia, is really the kind of person Father Edward Sourin had in mind when he founded the Philo in 1850. In spite of its rather lofty name and mostly well-to-do membership today, it was founded for the specific purpose of assisting poor young men, mostly immigrants, to obtain sufficient education to better their lives. Bob, who is also a past president of the Philo, is not an immigrant but his father Stanley was an immigrant from Lithuania. His mother Marie was of Lithuanian heritage but born in Girardville, Pa.
His father, a devout Catholic, was a hardworking man who operated a corner grocery in the Frankford section of the city back in the day when working class people would shop almost daily, putting the bill on the eye until payday. The problem was, during the Great Depression paydays could be few and far between. The family lost the first grocery store because of nonpayment by customers, but as times got a little better his father opened another store with more success. His father taught his children well, but trusted them too. In 1939, when the World’s Fair opened in New York, he let sons who were barely in their teens take a day trip by train on their own, and come home on the last train of the night. “I’m coming back as a man,” he assured his father and was true to his word. Bob was one of the lucky ones. After boot camp most of the men he trained with were quickly shipped overseas to man the amphibious assault boats at Normandy. He was sent to flight school and stayed as a trainer in the United States. Bob’s father died just about the time he was released from the military, and he immediately took on the responsibility of caring for his mother and guardianship over his younger sister, Dolores (Lorie), while working. With assistance from the GI Bill, he finished the required high school courses and entered a degree program at Temple University. He never did get the actual bachelor’s degree, instead he went on to American College where he received a master’s in financial services and also taught in the graduate program. As Lorie’s guardian he gave her the kind of Catholic education his parents could not afford to give him. It was through Lorie hat he met the man who would be his best friend for the next six decades. As a high school junior, through a blind double date, she met John Foley who was then attending St. Joseph’s Prep. Always the soul of propriety, the future Cardinal Foley asked Bob’s permission to take his sister out and it was granted. The two continued to date each other, although not exclusively through their college years, he at St. Joseph’s College and she at Immaculata College. They would travel from the Sims home in Havertown to Upper Darby for the movies by Red Arrow trolley. John, who was class president at St. Joseph’s University, confided to Bob his intention to enter the seminary. Meanwhile Bob, who was the founding president of the Philadelphia Chapter of the International Association of Financial Planners, founded Fin-Plan Group and ultimately Sims Financial Services LLC, of which he is still board chairman. In 1965 he married Gloria Lundell McCarter, a young widow with three children — Lisa, Dana and Ernest — and together they had Carter, Peter and Moira as well as a foster daughter, Barbara; all equally loved. It was a good marriage until her death in 2005. 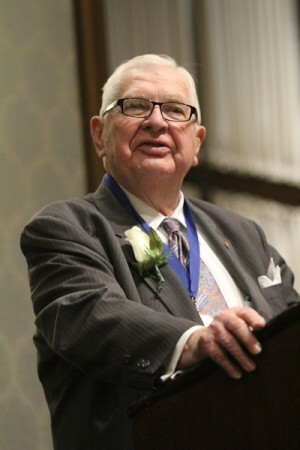 Over the years Bob was a member, director or president of an eye-glazing number of organizations and boards either in finance or related to the Catholic Church, with awards and citations to prove it. Included would be papal knighthoods in the Order of St. Gregory and the Equestrian Order of the Holy Sepulcher. He has served with four Archbishops of Philadelphia, starting with Cardinal John Krol. All in all, Bob has met four popes beginning with John XXIII. When Archbishop Foley was made cardinal in 2007 he introduced Bob to Benedict XVI, and explained they were friends for almost 60 years. “They had to be good years to last that long,” the Pope remarked. In spite of his very busy schedule Bob has made and kept friendships with many priests, and that too traces back to his father’s advice. As mentioned at the Sourin Award ceremony, the most recent pope Bob met through Cardinal Foley was Pope Benedict. Now that he is at an age when business matters do not take as much of his time, Bob, a 65-year member of the Malvern Retreat League and a current member of St. Katherine of Siena Parish in Wayne, has redoubled his spiritual activities to include daily Mass. Not a bad idea, considering we got them from the Lord himself. Beautiful story. My grandfather was from Ireland and he had very little education. He went to the Franciscon mission every year and my friend Jim Flavin and I also went. My grandfather wanted us to sing. Jim and I use to practice singing. Oh Father Saint Francis we kneel at your feet.